I have just returned home from a very productive and fun, full day beginner workshop at the studio. The photo above of some of the students first works all on a board together made me think of large orders that we do from time to time in the studio and how we work them in batches. Which in turn gave me the idea of a post on large orders. It can be quite a daunting feeling when asked to produce a 100 wine labels or 50 jewellery boxes or whatever quantity of a completely hand made product. It is not generally the problem of working out what to charge but rather working out exactly how long it is going to take to complete the order and whether you have the time and or energy to complete so much work in the time schedule specified. Never forgetting that you do in fact only have two hands to do the work and bearing in mind that we pride ourselves in hand made individual items and do not create machine pressed work with a factory finish. Below are some sample pics of the larger orders that we at Mimmic are often faced with. John and Simone’s wedding in October 2010. Michelle and I created a design which we produced in Pewter as wine labels for the male guests and trinket boxes with a pewter lid with each lady guest’s name worked on the top. The wedding was held at a game lodge near Bela Bela and the guests spent the night at the lodge. The wine and trinket box was placed on the pillows in each guest’s room for them on their return from the reception. The gifts were the talking point of conversation the next morning at breakfast. I receive many enquiries on how to use liquid glass, resin or Pratliglo (a name brand) to finish off trays that have been pewtered. This post is specifically for the lady who emailed us last week enquiring about the Pratliglo and for my Thursday students who are all busy making trays. Here are a couple of tips and thought processes to help you through this somewhat daunting process. 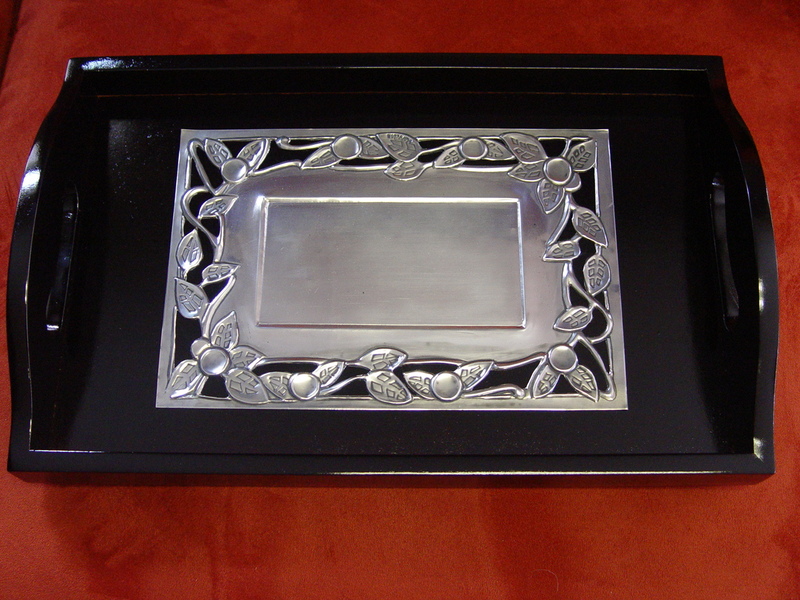 Filigree work also known as lacework is a perfect way of creating pewter for a tray. It allows the wood to show through the design and creates a tray cloth effect. There are a couple of important tips to create a fail proof project. Only create LOW RELIEF work. If you do high relief work you have to use an enormous amount of liquid glass to cover all the raised work which will make your tray expensive and very heavy! Use our cutting tool (on a cutting mat) to cut out the negative areas where you cannot get scissors in to do the job, the cutting tool helps to create a smoother edge better than that of a craft knife. Make sure your work is properly polished and remove any ugly marks, neaten all edges, be precise and very neat as the liquid glass acts as a magnifier and emphasizes every tiny imperfection! Your pewter work does not have to be sprayed as it is sealed with the liquid glass. Glue the pewter down very well with an overall thin layer of glue, this is very important as the liquid glass will run under the pewter and lift it and / or air will be trapped under the pewter which will then escape in the form of little bubbles later when you have covered your work and left it to set, these bubbles are so annoying because you will only detect them when it is too late to remove them and they will remain as a reminder that you should have glued your work down better! 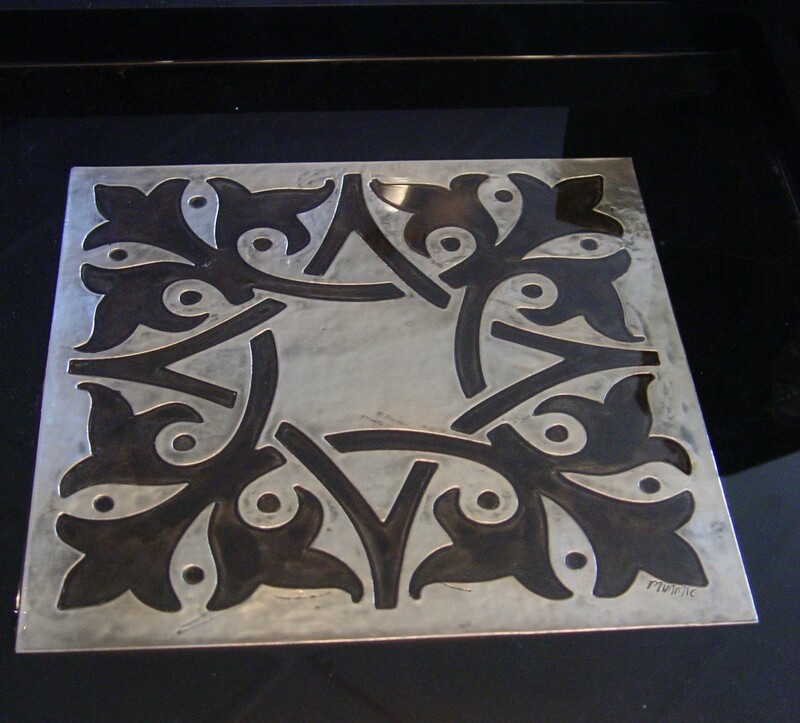 This tray which Michelle did was not cut out to create a filigree pewter piece. Instead, Michelle applied her patina, polished her work to create a beautiful shiny background and then re-applied patina with a paint brush to the design creating a stunning contrast between dark and light. 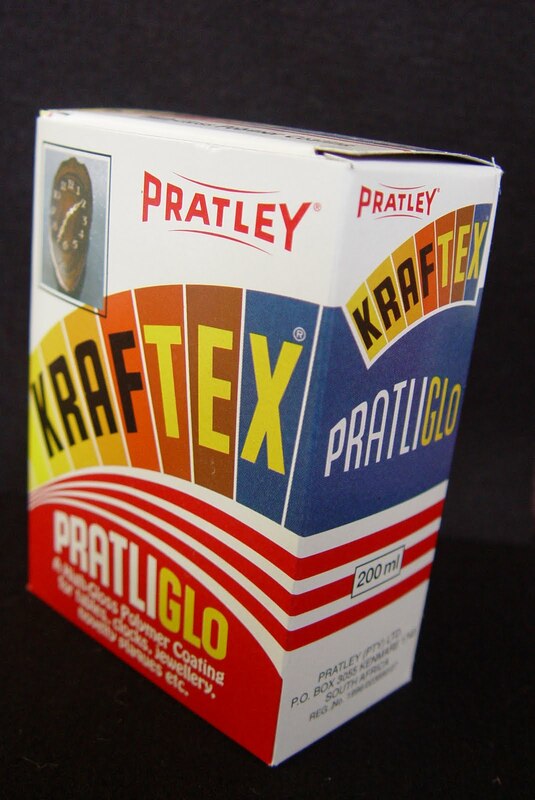 Pratliglo is the liquid glass product which we sell in the studio. It is a very simple but very precise process used to apply the product. Follow the instruction very carefully. I have a couple of important tips that will definitely help you through some issues you may have when working with it. 1. Never work with it when there is moisture in the air (when it is raining.) It will not set! 2. Equal quantities is imperative for the resin to set. 3. The two bottles of mixtures have to be thoroughly mixed; a missed speck of unmixed liquid on the side of the cup could cause the mixture not to set properly. 4. One box is sufficient for our long cocktail tray and two boxes is needed for the large square tray. 5. The ‘huffing’ not blowing motion over the poured resin is an extraordinary and fun process, the CO2 in your breath miraculously make the millions of bubbles disappear and leaves a beautiful clear glass effect. 6. Don’t forget to cover the tray properly, a hair or ant stuck in your glass finish won’t be great!